The Other Face of Portugal? I was tempted to title this post “The Unacceptable Face of Portugal” but perhaps it is not my place to be judgemental about other cultures. Those who follow my blog will know that I hail from the UK but spend almost half of my time in Portugal, a country I love which is populated by exceptionally wonderful people. It was the people who attracted me more than the lovely weather. A while ago I was in an out of town restaurant and there were some people eating what I thought were quail (codornizes in Portuguese). There was a good deal of furtiveness going on but when I asked directly it turned out that they were eating small wild birds that had been caught illegally. I should point out that there is a strong hunting tradition in Portugal which explains the almost total absence of rabbits and similar small wild animals, as well as very few small birds (plenty of seagulls). Recently I was geocaching no more than a mile from a popular tourist beach, albeit on some waste ground that tourists wouldn’t visit, when there was a snapping noise and some minor pain in my fingers. I had inadvertently found a homemade bird trap. In fact about 20 of them – I tripped the others with a stick and removed them after taking a photograph. If you look closely you will see that the trap has been baited with a large ant – which was still alive and wriggling. I make no apologies for confiscating the traps, although maybe I should as it is none of my business and part of Portugal’s (albeit illegal) culture. Stinging fingers were another justification for removing the offending articles. I have never participated in foxhunting, or attended a bullfight, but I collected birds’ eggs as a child and regularly swat flies with an electric tennis racquet. Let he who is without sin cast the first stone! 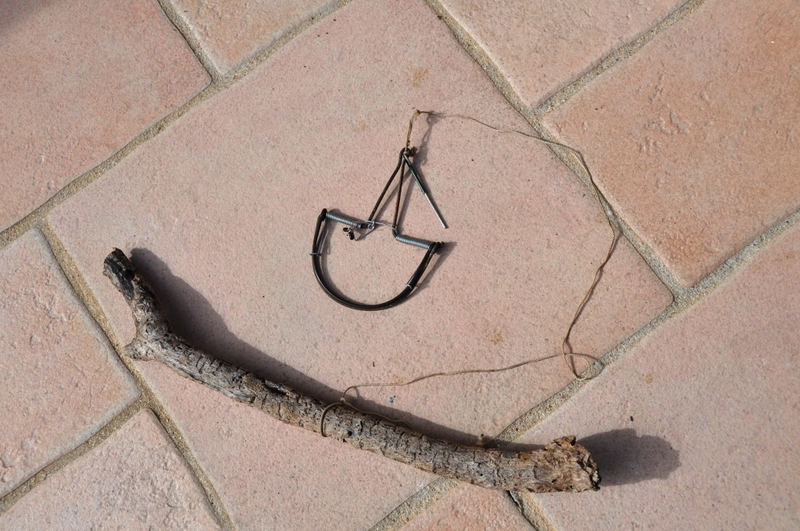 This entry was posted in Home and tagged algarve, bird traps, geocaching, hunting, photographs. Bookmark the permalink. 2 Responses to The Other Face of Portugal? Interesting subject. I can see where you are coming from with regards interfering in other cultural traditions etc but it doesn’t make it acceptable. I am not a full on animal rights flag waver and all that but this just seems cruel. As for interfering well I spose you do what you feel is right and be prepared to face the objections from those who disagree. Personally a thumbs up from me if only to stop some other poor person trapping their fingers in the future. There is a world of difference between shooting and trapping. In our region of the Algarve, the hunters take responsibility for the upkeep of the countryside, and we were fortunate at the time of the fire in July 2012 that the hunters were able to safeguard our house. The hunters tend to breed their own partridges for their sport. The trapping of small songbirds for the table is another matter. The use of these spring traps is illegal, and the GNR should be preventing their sale. I suspect that it is necessary for someone to denounce the vendor before the GNR will take action. Since you have mentioned bullfighting, I have to say that it is a spectacle which I enjoy, particularly the forcados. There is more to bullfighting than general cruelty, such as the horsemanship, which it is a joy to witness. Perhaps if the barbs on the bandarilhas were replaced with some powerful surface glue, there would not be so much blood about, but the opponents of bullfighting would still not be appeased. I hope that the tradition survives as the cultural spectacle that it is. The ban on foxhunting, which you also mention, has in parts of Britain caused an explosion in the fox population, particularly in towns, where they feed off discarded food and through the misguided do-gooders who leave food out for them. Foxes are vermin, and yet there seems no means to control their population, now that the natural means, foxhunting, has been prohibited.